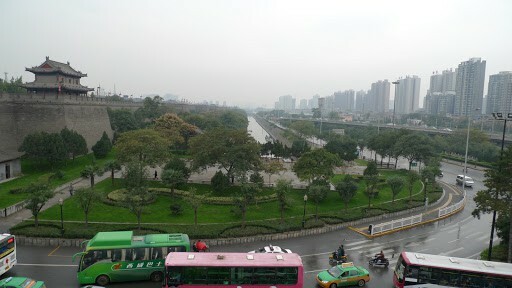 We now find ourselves in beautiful, charming Xian. 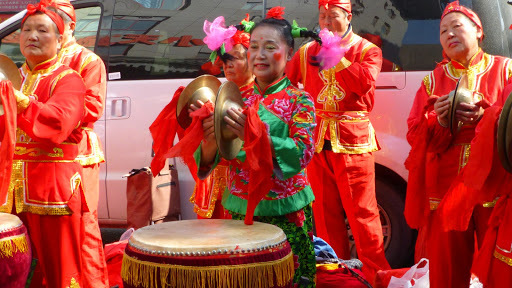 Incredible to think that yet again we put our lives so willingly into the hands of random Chinese pilots and air traffic controllers (flying Northern China Airlines from Hangzhou). Willingly, blindly. With fingers crossed. Fortunately with the best possible outcome, and no complaints from our dozen. 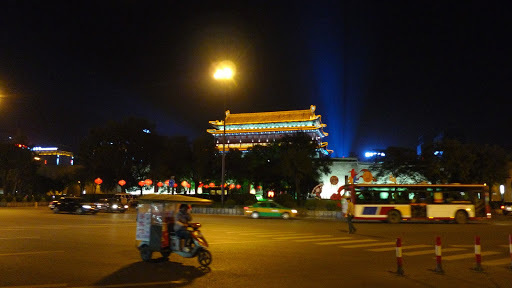 We were especially glad for the opportunity to stay 3 nights in Xian. On our previous o/s adventures we’ve traveled “slow” with minimum 7 days in the one place. 10 days is great and 2 weeks is ideal. 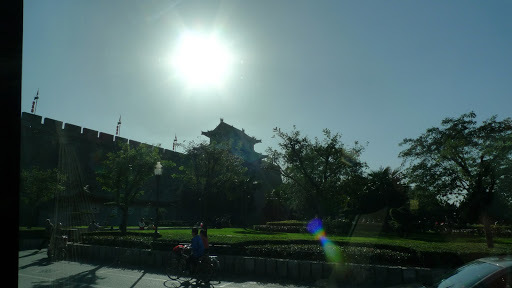 But this Intrepid Grand China trip is entirely different to anything we’ve ever done before and we’re really glad we chose this way. I doubt we could’ve done it on our own. The hotel Intrepid chose for us is again lovely and everything we could hope for. 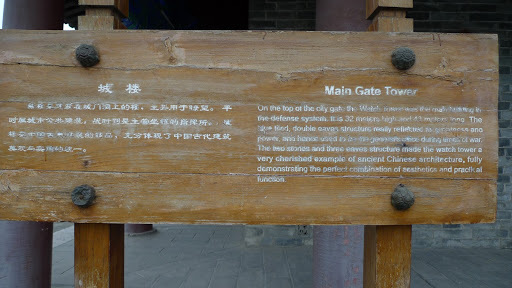 Situated within the ancient City Wall, we had close access to everything this fascinating city offered. Especially the “bar street” and a really cool YHA hostel, with a great bar, free wi-fi and very interesting clientele. We spent a few idle evening hours there. 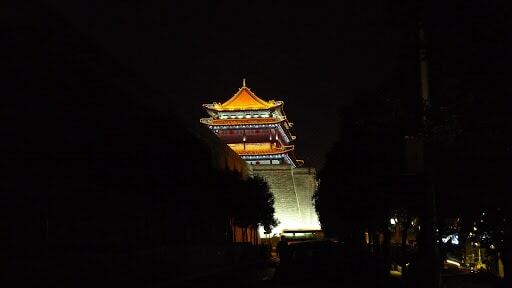 It’s the kind of place we could stay at if we ever return to Xian (I hope so). Although 4 star living’s pretty darn comfy and very affordable in China. 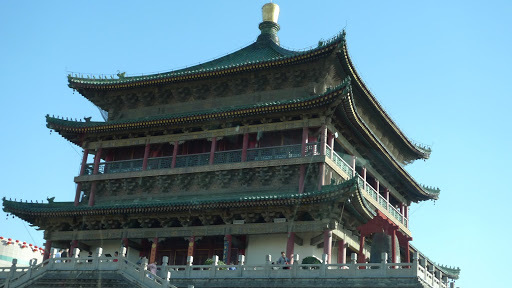 The very beautiful Bell Tower, center of the city. 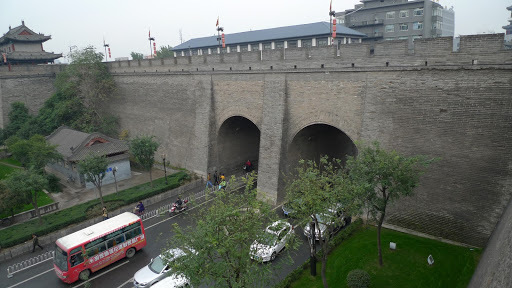 The most complete and intact ancient city wall in China, the Xian City Wall is over 600 years old. 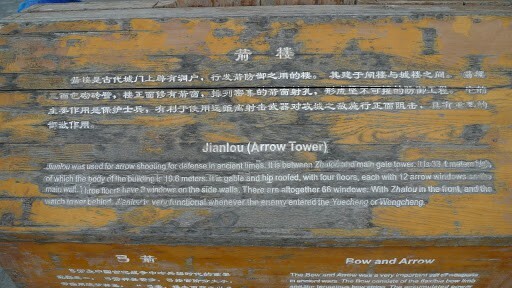 The distance between every two ramparts (120 meters) was just within the range of an arrow shot from either side, so that they could easily shoot the enemy. 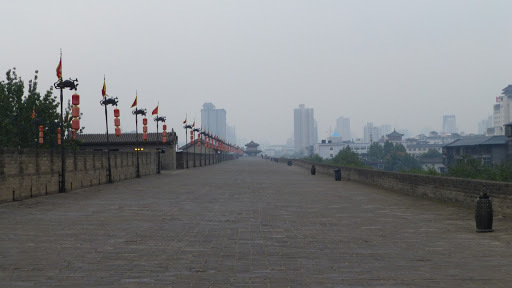 Standing just over 12 meters high it’s the most complete city wall that has survived in China, as well as being one of the largest ancient military defensive systems in the world. 12-14 meters wide at the top and 15-18 meters thick at the bottom, 13.7 kilometers in length with a deep moat surrounding it. 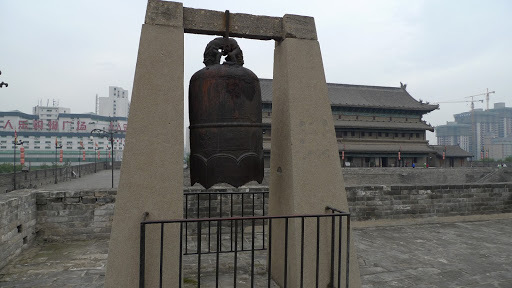 4 complicated gate structures were built within the wall and they are respectively named as Changle (meaning eternal joy) in the east, Anding (harmony peace) in the west, Yongning (eternal peace) in the south and Anyuan (forever harmony) in the north. The day for us to visit the wall the weather turned freezing cold (below zero!) and wet so we were disappointed not to be able to bicycle around the top of the wall, which is a really popular activity. 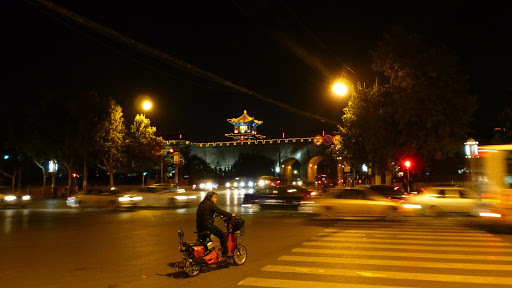 So for us it was a ride around in a golf cart, driven by a pretty uncommunicative guide. Oh well, it was still a great experience. 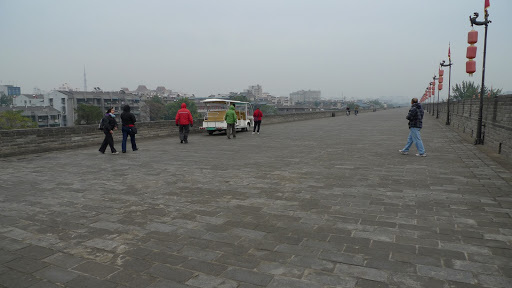 The top of Xian’s City Wall is a wonderful place to stroll, but sadly not for us today. A golf cart for us on this freezing wet day. I haven’t talked about my favourite topic for a while – FOOD. 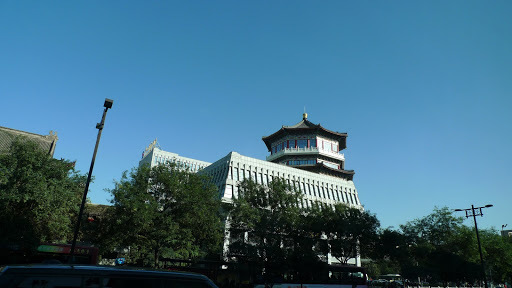 In fact, now that I understand a bit more about travel blogging, my photo-taking will be very different next trip. Writing this blog has been a huge learning curve for me. 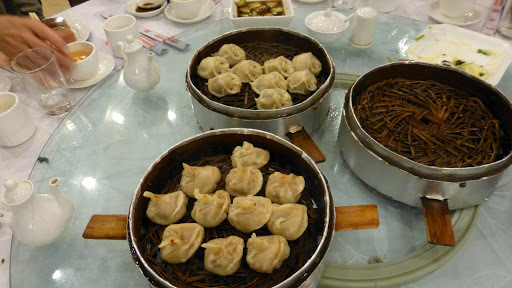 Jing took us to a dumpling banquet (called Jiaozi in Chinese), which is very popular food in north China. I’ve never tasted dumplings like it. In Australia dumplings are comparatively quite expensive and can be rather bland. I haven’t found any to match the Chinese offerings. I wasn’t quick enough to take photos of the food because it became a feeding frenzy right from the beginning. So only these few photos, but they do give a pretty good idea of what we feasted on. 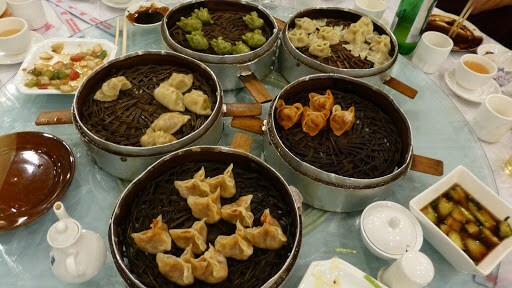 Dumplings of all different shapes and flavours. 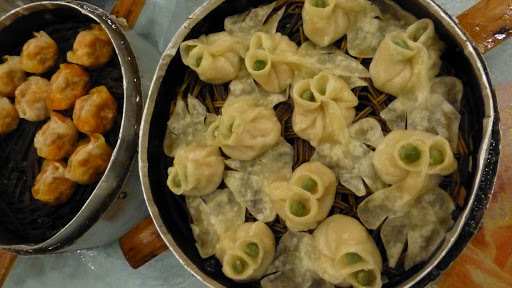 In the north of China, dumplings are eaten with black vinegar, not soy sauce. In fact, vinegar is the preferred condiment for most dishes in the north and soy is rarely used at all (although available on the table alongside the bottle of delicious black vinegar). 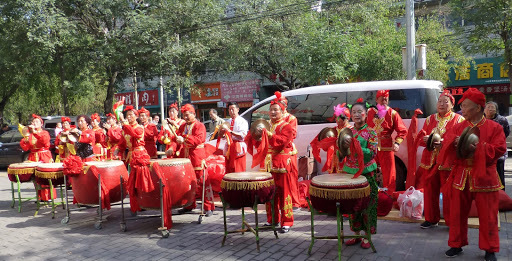 One afternoon, just enjoying some well deserved down time at our hotel, I could hear the sounds of drums and singing and so we set off to find out what was going on. Around the corner was some kind of official opening for a child care center, and these beautiful people were there to help with the celebrations. 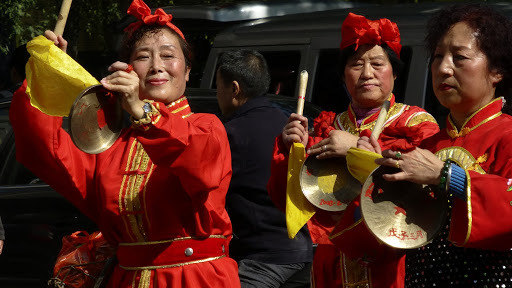 Of course, the major attraction in Xian is visiting the Terra Cotta Warriors Museum. 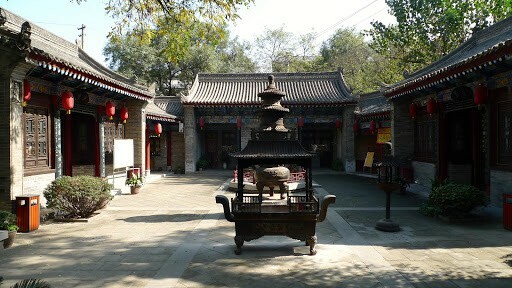 The museum is the reason Xian is world famous. Discovered in 1974 by some local farmers digging for a well, the site is one of the most significant archeological excavations of the 20th century. 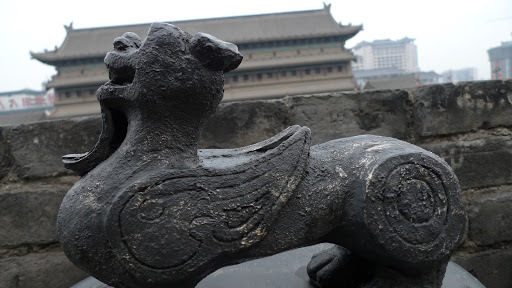 Next post I’ll be showing photos and sharing information of this incredible site as well as a visit to “Hui Ling”, a charity sponsored by Intrepid Travel for people with learning disabilities – huge fun.